The Russian company plans to exhibit the multi-role Ka-62 and the Mi-171A2 at the exhibition that opened in Hyderabad today. Russian Helicopters said it will be taking part in the India Aviation 2014 international civil aviation exhibition and conference, which began today in the city of Hyderabad. 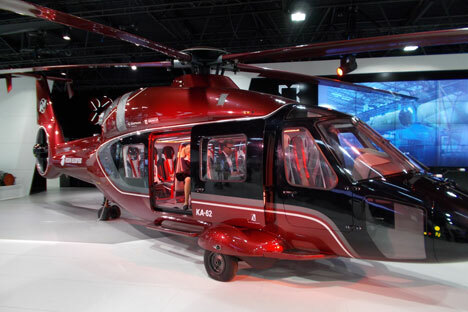 “At the event, Russian Helicopters will showcase its current and forthcoming helicopter models to operators from across South and South-East Asia,” the company said in a press note. The multirole Ka-62 will take pride of place at Russian Helicopters’ stand at the exhibition, the company said. “This new model, developed in close international cooperation, incorporates the latest technologies in aircraft building and the finest achievements in Russian helicopter construction,” Russian helicopters said in the statement. The company also said its specialists would hold a series of business meetings over the course of the exhibition at which they present the Mi-171A2 helicopter. “The Mi-171A2 is an advanced helicopter model based on the Mi-8/17 series that has been in successful operation across the world for decades. This experience is coupled with the latest technological advances in the creation of the Mi-171A2,” Russian Helicopters said. At India Aviation 2014, the company also plans to showcase series models of the Mi-8/17 and Ka-32A11BC multirole helicopters. Both models are in operation in various countries across the world, where they complete a wide variety of missions, according to the press note. The exhibition, which is being held for the fourth time, is being organised by India’s Ministry of Civil Aviation and the Federation of Indian Chambers of Commerce and Industry. India's fleet contains more than 200 Russian-made Mi-8/17 helicopters. One of the most prominent trends in the development of Russian military-technical exports is the country's shift from traditional sales to joint production, which is in line with the latest Indian defence procurement policy. Russian Helicopters already has an on-going project with an Indian partner. In December 2012 in New Delhi, it signed an agreement with Elcom Systems to create a joint venture to assemble Russian helicopters in India, including the Ka-226T.